hmm, I thought I’d posted this entry last weekend?…..obviously I didn’t press the thing that does the posting thing. In contrast to the scorching hot summer days we’ve been having here lately, this morning got off to a cloudy start with temperatures only reaching the upper teens. 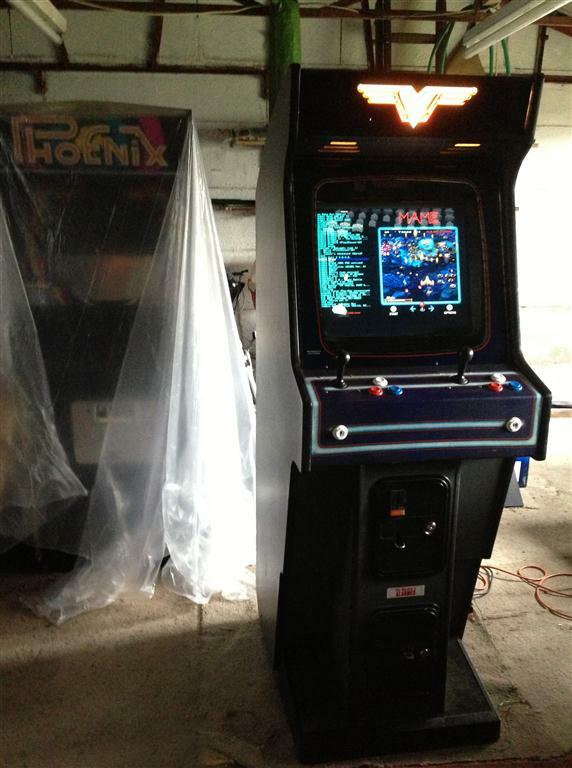 It’s perfect really as i’ve been meaning to get into the garage…sorry, i mean ‘Arcade Man Cave’, to finish off the last few jobs on my arcade cabinet for which I need to keep the garage door shut so that airborne stuff doesn’t blow in and stick to the drying paint. In the heat of summer, it can get awful hot in there with the doors closed. My first task was to give the coin doors and their surrounds a lick of hammerite paint after sanding off all the loose bits a few days ago. I went with textured paint in the end which appears to match what was originally used. 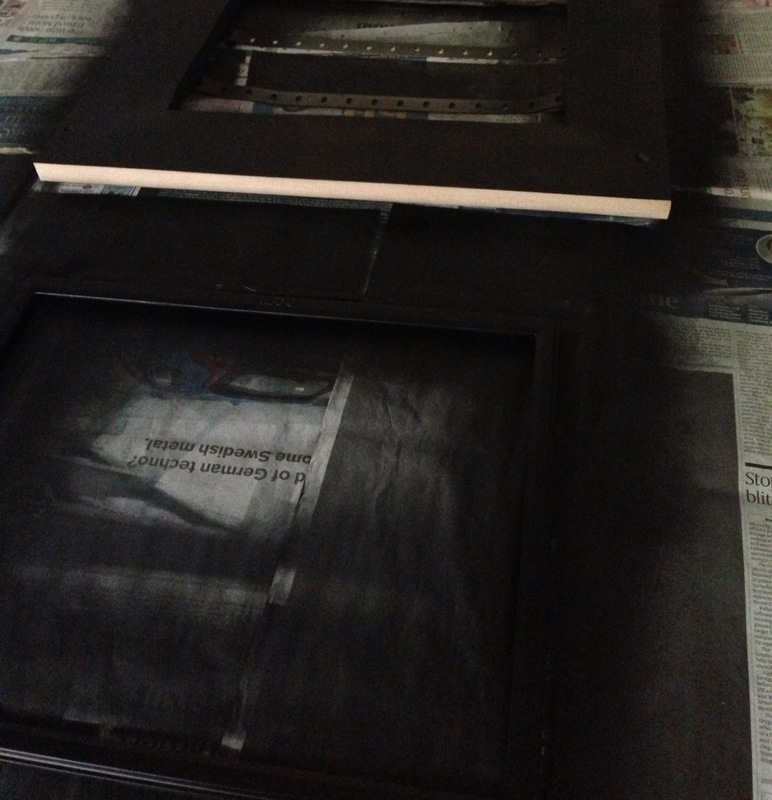 Next was to paint the monitor surround (matt) black and also the monitor trim to match. This mornings newspapers came in handy here…..who needs the Financial sections on a Sunday anyway? I used automotive spray paint for this – nothing fancy, just the cheapest matt paint I could find as Gloss would have just bounced the light around and might have looked terrible especially through the glass bezel at the front of the cab. Two coats applied and between drying coats, respite from the rising heat and on to a few odd maintenance jobs on the veggie plot. 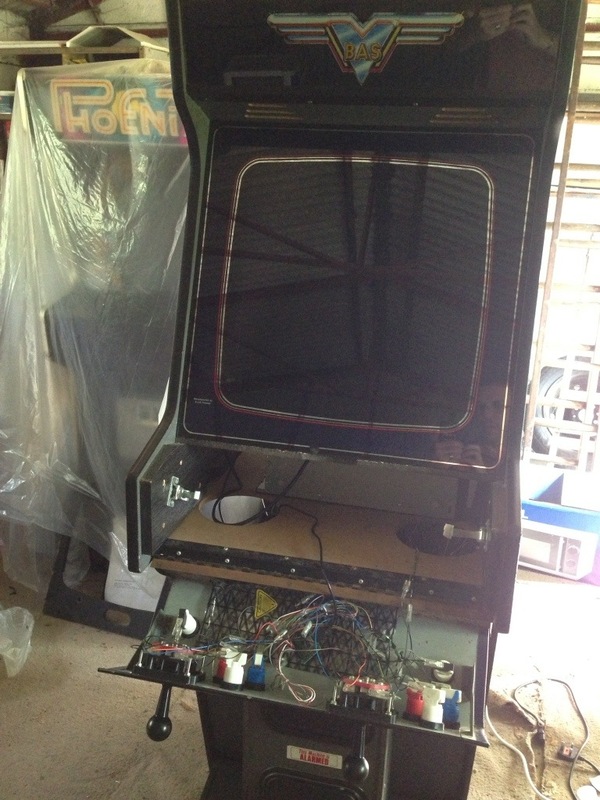 When everything was dry, I fitted the monitor back into the cab and also took the time to fix a little issue with one of the control panel latches that kept catching on one of the control button cables and disconnecting it. That’s pretty much everything done on this cabinet now and its been great fun putting it all together. Highly recommended! 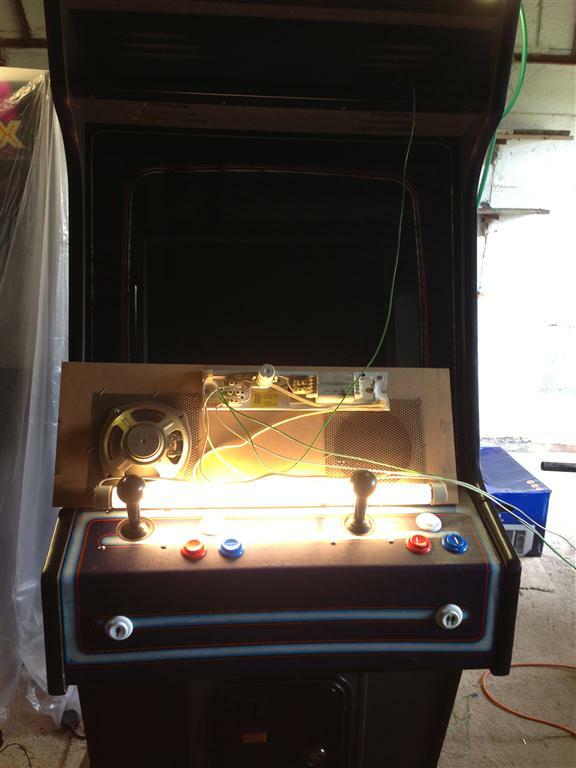 With the the Mame PC and CP pretty much finished now I thought I’d spend the afternoon getting the marquee light and speakers installed. Before doing all that though, I need to trace some of the original wiring as there’s a few bits and bobs that I’ll reuse and other parts such as most of the Jamma harness and power supply needs removing. Regarding the PSU, it’s fully working although I don’t have a use for myself I’m sure there’s someone on the Jamma+ forum that will find a use for it. I’ve cut away the old tie wraps from the metal staples securing the original cables in place. Once I know which wires I’ll be reusing plus my own wiring I’ll re affix fresh tie wraps to keep it all nice and tidy again. 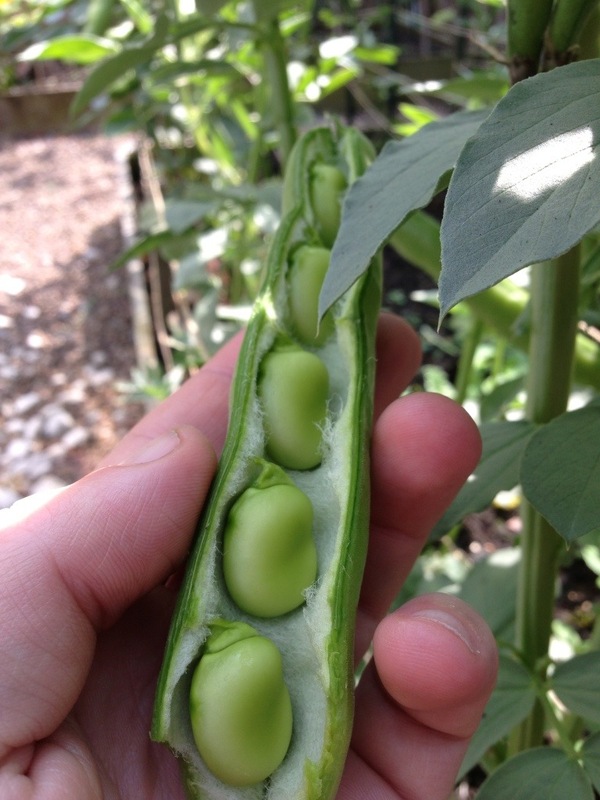 …but first we have to make a mess to sort this lot out! eeek, the Jamma monsters got me! 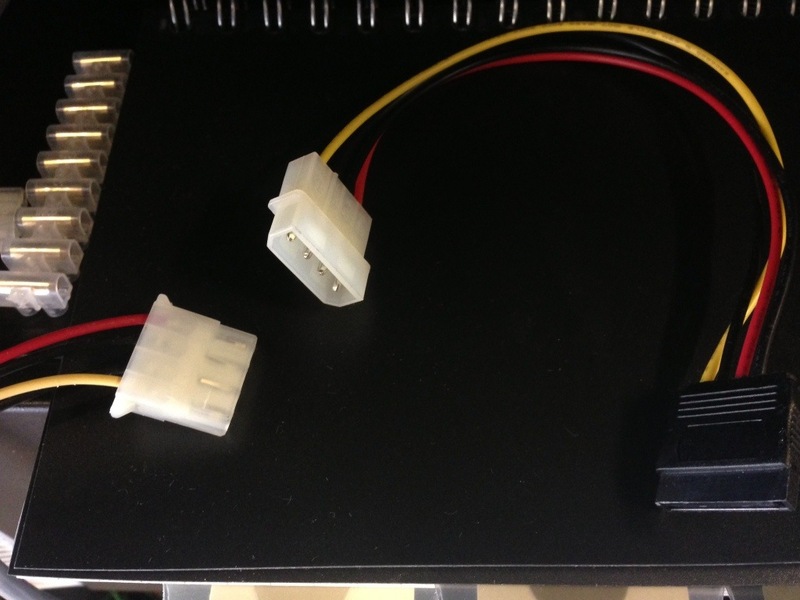 I’ve retained the original arcade power switch that’s found on the external back side of the cabinet. I plan to rewire this to the PC power switch allowing me to switch it on without having to remove the cabinets rear panel. I’ve also found the original alarm button too and although I won’t be reusing it, it’s quite interesting how it works. 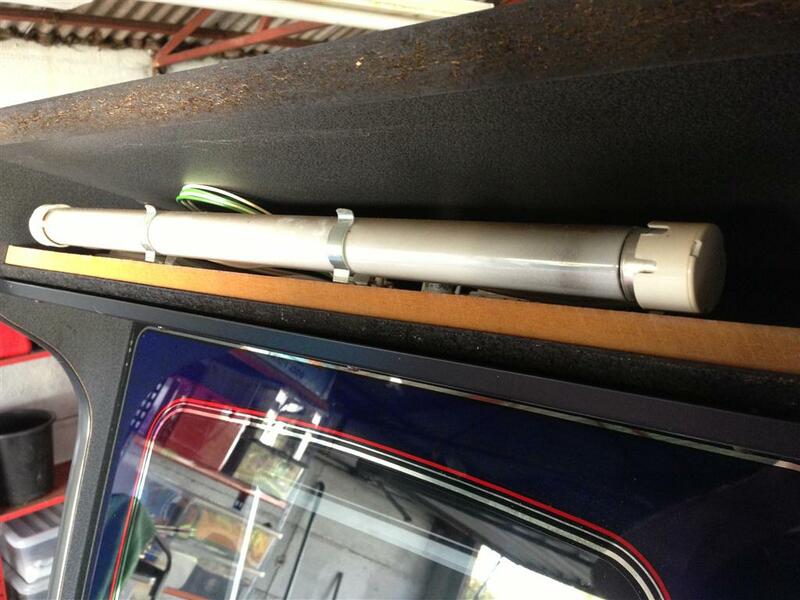 Basically, when the rear panel is fitted, the panel presses up against a switch. If a thief tries to remove the back panel (thinking it an easy way to get to the coin box) the button is released, alarm bells ring and everyone goes mental etc etc. That’s the wiring sorted out for this stage so time to have a looksee at what’s lurking behind the marquee panel. I’ve removed the screws that hold the marquee clip in place and gently moved it out of the way as I had no idea the marquee was actually glass…I’d always assumed that most were perspex. Like the game board, the marquee assembly is fitted to a single piece of wood that slides out on two guide rails either side of the cabinet. 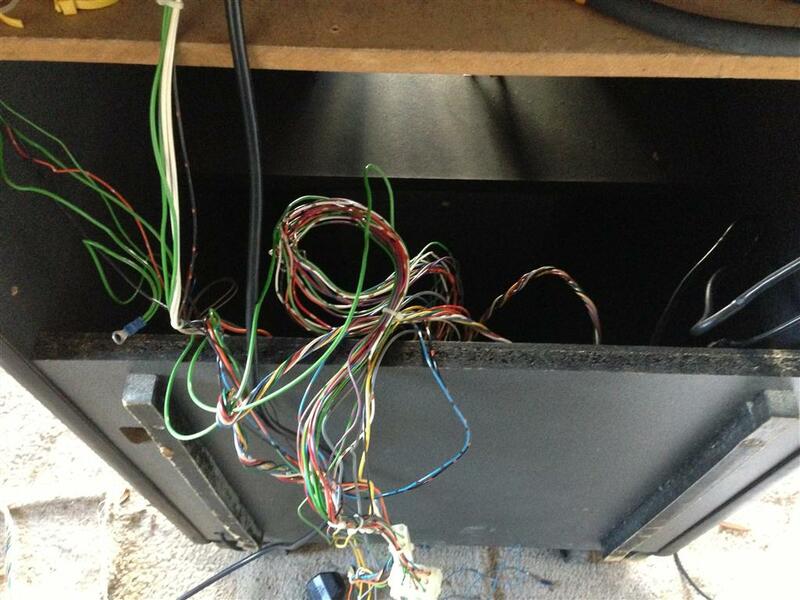 I must say, the makers of this cabinet have made it really easy to get to all the serviceable parts which is why this particular build is becoming most enjoyable…unlike the unfriendly Phoenix cab. 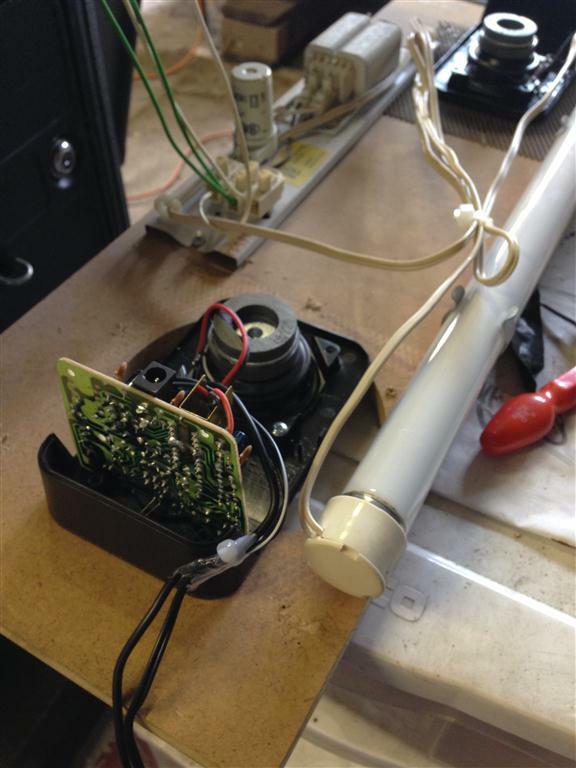 A-ha, the burglar strikes again, someone’s nicked my right speaker 🙂 Actually, looking at the wiring, I think this cabinet only ever had one speaker. 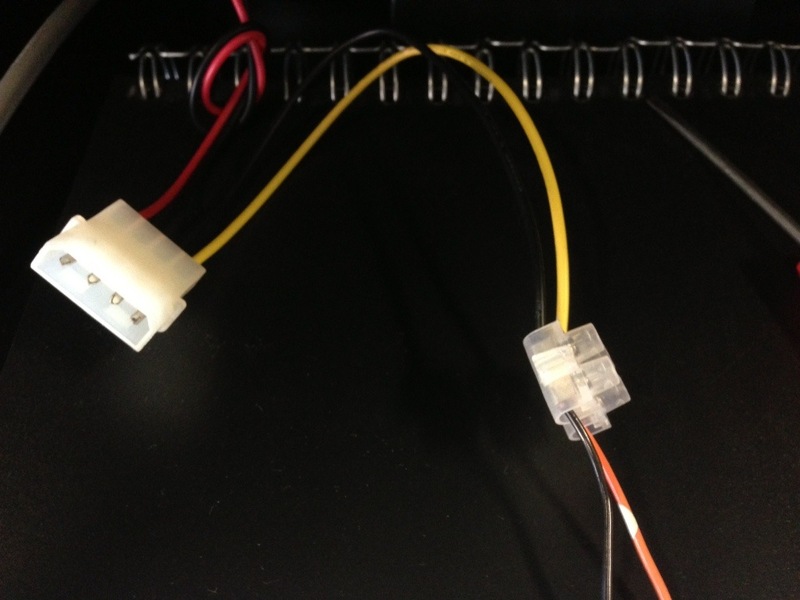 Having previously removed the light strip wires from the arcade PSU, and having checked the ratings on the transformer, I attached a regular plug and switched on the mains to test…..nothing. I’m not surprised though after lifting the florescent bulb out and there was definitely a hint of something loose inside. Wow, it was super busy here, but as expected because after a late start, spring is finally here, the sun is out and folk are out in force buyinggardening toosl, lawnmowers and patio furniture. Thankfully, nobody was in the Arcade Machine building section…aka, the light bulb area, so I was able to get in and out before getting stuck at the checkout. 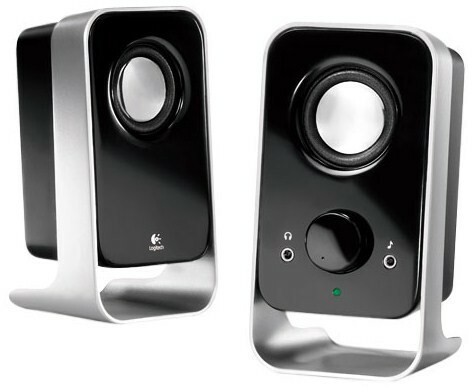 The PC speakers I intend to use are a cheap set from Logitech which I picked up the other day. They’re basic, no frills but the sound quality is surprising good with ample range from top to bottom. I tested these out on my PC running a few Mame games the other day and am very happy with them. The speakers aren’t going to fit in the small area as is because the plastic casing is quite bulky. Out with a screwdriver and my dremel to crack them open. 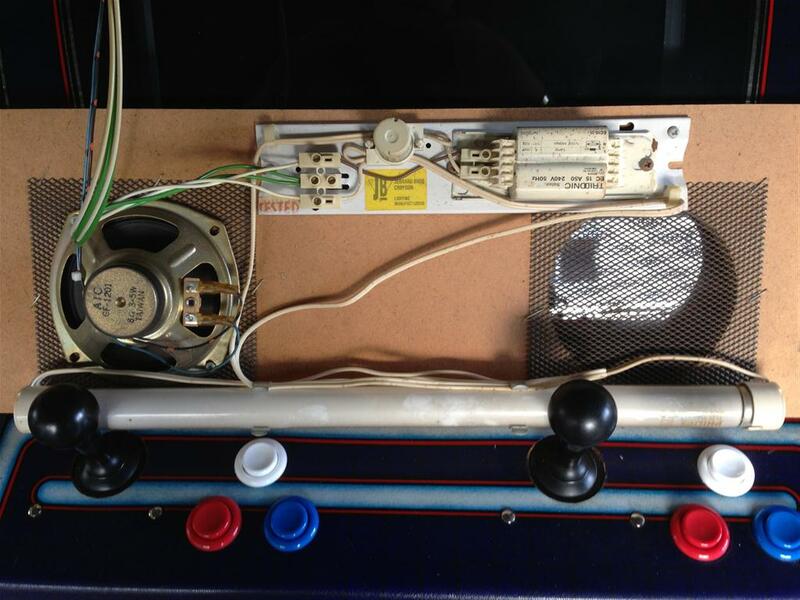 It isn’t pretty, but now I can mount them to the speaker grills and have the volume control pointing downwards where I can get at it once I extend the shaft of the potentiometer behind the volume button….well that was my original idea for having external volume control but I’m finding it just as easy to adjust any game volume on the fly with Mame’s build in menu system. Still, the options there if I want a physical solution. With all of the cables temporary wrapped up, I reseated the marquee board back into the cabinet, refitted the glass marquee and clips and finally switched it back on again to see what it looks like. ……although I’ve spotted a few areas (marked) where the marquee paint must have been scratched from behind as you can see light shining through. An easy fix though. So that’s the light and sound sorted and the next bit on my list is getting the coin mechanism working. So with the PC fitted and everything hooked up to test the speakers and controls etc…there’s no way I was going to finish off the day without firing up this bad boy for my very first game test. MameWAH loaded and ready to Rock! 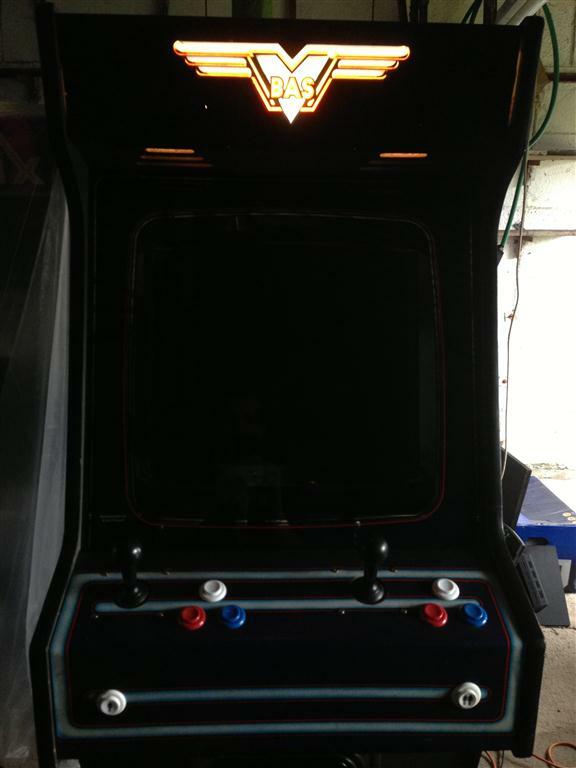 Yay, Twin-Stick awesome-ness with Robotron……I may be some time! 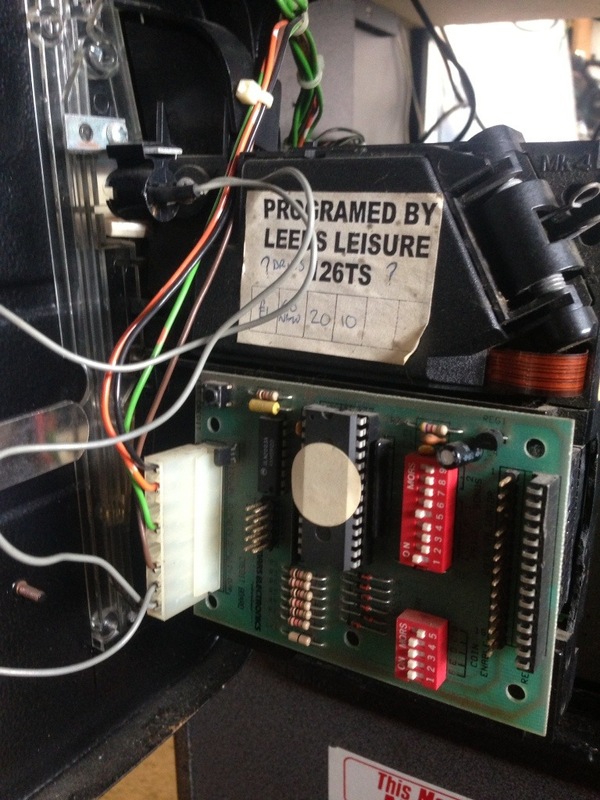 Mame Arcade Machine: Door locks. 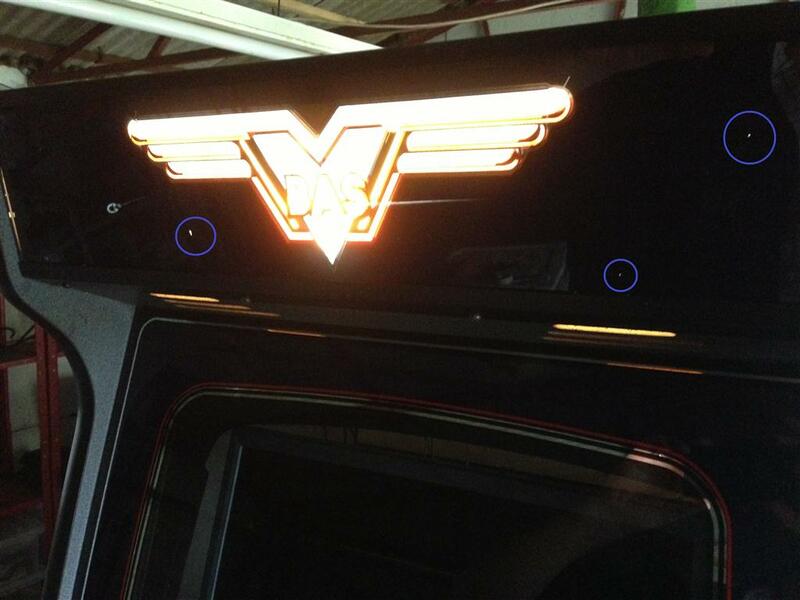 Only a quick update on the arcade cabinet today. I’ve now got two replacement locks for the coin doors and one for the rear back panel which I’ve fitted this evening. The removable portion of the back panel is practically held on with just the lock so it’ll be nice to have it in position again to shut out all the light bleeding in around the edge of the monitor. Having had to source these from a gazillion online vendors and pouring over endless searches, I’m becoming a bit of a lock nerd and find myself talking about cams , tumblers, tubular seven pin, cam barrels, keyed to differ or alike, straight or cranked, 90 or 180 rotation. Also I’ve discovered that if you’ve accidentally ordered a straight cam instead of one that needs a slightly cranked end, one should simply whack it a few times with a large hammer. Perfect! If there’s any lock nerds out there that are interested, mine are 27mm cam locks, keyed alike, 90 degree turn with 45mm straight cams….and one slightly bent one. Also, if anyone knows how to cure lock nerdism, please let me know.